(Nanowerk Spotlight) Olfaction, our sense of smell, depends on the capability of specialized sensory cells in the nose to detect airborne odorant molecules. These olfactory cells contain specific protein molecules that acts as 'olfactory receptors' – they bind only to specific odorant molecules present in the air inhaled through the nose. When such a binding event occurs, the olfactory receptors change their shape and this deformation triggers chemical and electrical signals which are eventually transmitted to the brain through neurons. So, in a nutshell, this is how we smell. Human and especially some animal noses (think bomb-sniffing dogs) are very sophisticated and extremely sensitive gas sensors that can distinguish between very similar gas molecules. Researchers have been trying for a while to replicate the human olfactory sense – a concept called electronic nose (e-nose). Nanotechnology holds great promise in realizing this goal (see "Nanotechnology electronic noses "). While most efforts have focused on nanowires, new research conducted in Korea has demonstrated the detection of specific odorant molecules with a single-carbon-atomic resolution using a human olfactory receptor-functionalized carbon nanotube (CNT) based sensor. "We have fabricated carbon nanotube-based field effect transistors (FETs), which can detect electrical potential changes around them, and then, for the first time, we successfully coated these FETs with cell membranes containing olfactory receptors which specifically bind to 'fruit flavor' odorant molecules," Seunghun Hong tells Nanowerk. Hong, an associate professor of physics at the Hybrid Nano-Device & Nano-Assembly Lab at Seoul National University, and his group, together with collaborators from Tai Hyun Park's group at the university's Institute of Bioengineering, have developed a strategy that overcomes the poor selectivity problem that characterized previous chemical sensors. They accomplished this by combining human olfactory receptors as a sensing element, while single-walled CNT-FETs enabled the high sensitivity of the sensors. "When we introduced 'fruit flavor' odorant molecules to the coated CNT-FETs, the odorant molecules attached to the olfactory receptors on the CNT-FETs," Hong explains the workings of their e-nose. "This binding deformed the olfactory receptors and changed the electric potential around them, which was detected by the underlying CNT-FETs." The result is that these coated CNT-FETs work as a highly-specific and sensitive odorant sensor which can detect specific odorant molecules just like the human nose. What is most significant about this device is that – since the binding of human olfactory receptors is extremely specific – it can distinguish different molecules with only a single-carbon-atom difference. 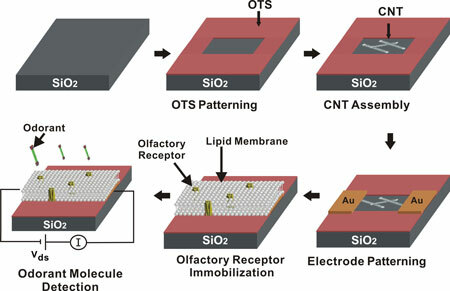 Hong's team has reported their findings in Advanced Materials ("Single-Carbon-Atomic-Resolution Detection of Odorant Molecules using a Human Olfactory Receptor-based Bioelectronic Nose"). Most previous 'electrical nose' and other gas sensors utilized semiconductor-based FETs which are not highly specific and respond to multiple gases. This work by the Korean scientists represents a significant advance in gas sensor technology and electrical nose applications because it allows to build highly specific odorant sensors. It might allow the fabrication of advanced sensors for detecting hazardous materials, the screening of new perfume ingredients for the cosmetics industry, or developing artificial noses for elderly people to regain their lost sense of smell. Furthermore, according to Hong, this work can provide a significant advance in the biophysics area. "Our results show that we can monitor the deformation of membrane proteins such as olfactory receptors using our CNT-FETs," he says. "Membrane proteins (e.g. olfactory receptor, ion channels) usually lose their shape and functionality once they leave the cell membrane. Therefore it is extremely difficult to study or monitor these membrane proteins. Our work provides CNT-FETs as a new tool to monitor the electrical potential of the membrane protein in real time."